My backpacks have taken a backseat last year. 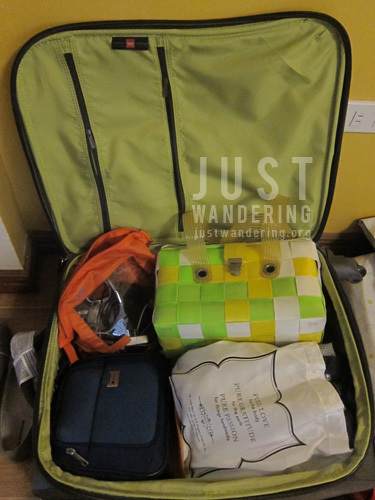 In my major trips last year (Guam, Morocco and Kuala Lumpur), it was my bright red luggage that accompanied me. It’s not that I’ve stopped backpacking; more like traveling to places where walking around in t-shirts, shorts and flip-flops is not the most practical thing to do. I love the mobility I get with my backpacks, but there’s something to be said about the simple joy of throwing your clothes into an empty suitcase. That’s what I did a couple of weeks ago. The wonderful people at Delsey gave me a lovely token: a 65cm 4-wheel expandable trolley from their Fiber Lite line, just in time for my week-long trip to Kalibo. Yeah yeah, I know it’s absurd traveling with a suitcase that can carry up to 20 kilos just for a 7-day trip, but it gave me the freedom to pack stuff I wouldn’t have been able to if it was just me and my backpack. See, I was traveling with my dollie friends and also working the rest of the week. Three big-headed dolls each approximately 12″ tall, a 15-inch laptop, a week’s worth of clothes (mine and the dolls’) — they can’t all fit inside Viktor. That happened to me last year in KL. I stupidly locked BOTH my bags with my key cards inside the luggage. I remembered this video and was able to open it. Actually, I was even able to open it without using a pen or anything — the zips didn’t align properly in one corner and I was able to pry it open using that tiny gap. I was grateful that I was able to open it, but in hindsight, it’s worrying because if I can open it that easily, other people can, too. Worse of all, they can even do it without leaving any visible trace. That made me think about investing on a new set of luggage that gives my things better security. In comes Delsey, almost right on cue! (Thank you universe!) 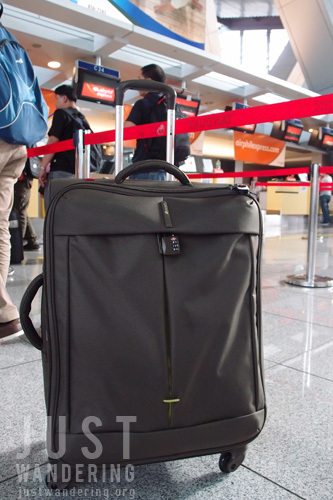 The Fiber Lite is one of their lightest luggage, the 65cm luggage weighing only 3.6 kilos or 7.9 pounds. It also features Delsey’s latest innovation, the Zip Securi Tech system, which consists of two layers of zipper that makes it sturdier and almost impossible to pry open. The double zippers have some resistance when opening or closing, but not so much that it requires a lot of effort. A small sacrifice for the sake of security. This is my first time to own a four-wheeler and I have to say, it’s going to be tough going back to the two-wheeler. I’ve always wondered what the big fuss is about the four wheels and when I was rolling the bag after it was packed, I finally understood: it really is much more convenient to use. Having four wheels meant it’s easier to maneuver your bag in the crowded airport, but better still, it meant no strain on your shoulder and arm when you’re moving from one end of the terminal to the other. I’m a notorious over-packer; I know that walking around and dragging a 15-kilo carry-on trolley is just as strenuous as with a heavy backpack. With the Fiber Lite, I just adjust the handle to a comfortable height and lightly pull it along as I walk. My gadgets bag, dollie bag, clothes and waterproof bags, and my Delsey toiletry kit, which also came as a surprise — a Christmas gift from my accountant that arrived the day after I got the bag! Inside, it’s roomy (as is all empty suitcase). However, what stood out for me is the inside pocket. Unlike my old luggage that features just one big mesh pocket, the Fiber Lite has two compartments, which is perfect if you want to keep some stuff separate from the others, and within easy reach. There is also a separate pocket outside, which also rather common, but what really stood out is that Delsey made sure that the zips have these lock holes so you can also make sure that nobody will be opening this compartment and getting — or worse, putting — stuff inside without your knowledge. Speaking of locks, the Fiber Lite comes with a TSA combination lock, so you won’t have to worry about forgetting to get one for your luggage. I’m using the Delsey lock for the front pocket zips and put my Pacsafe lock in the main luggage compartment zip. I just have to make sure never to lock my keys inside again. Delsey Premium French Luggage is available in all The Travel Club Stores, Duty Free, selected SM Malls, Robinsons and Landmark nationwide. Delsey will be holding a “Break-In Challenge” on February 16-22, 2012 at the SM Mall of Asia. Anyone who will be able to open a Delsey luggage with a pen in under 10 seconds will win Php 50,000 cash. All who join will be eligible for a raffle to win a Delsey luggage worth Php 15,000. Not willing to try your luck? Bring your cash because there’s going to be special discounts on Delsey luggages on those dates! The 3.6-kilo weight combined with all the space makes this something to consider ha! Those three dolls + gadgets are huge! The lock holes are great, my bag isn’t like that. Nice.